***yick~yack~yakkity~yack***: When TiTy Talks About writing a Tribute entry to her parents. When TiTy Talks About writing a Tribute entry to her parents. Today is my parents 28th Anniversary! (^_^). This entry is written as a tribute to both of them. According to them (not them), let me restart my sentence. According to my mum (my dad never really told us about their love story ah!) their relationship started off when they were still in their secondary school. But at that time it was more like ‘chenta monyet’ la konon..haha..(ada juga ba!). My dad then went of to Sarawak to pursue his dreams. And unlike my dad, my mum didn’t get the chance to further her studies since she did not come from a wealthy family. And my dad did come back for her! Without news and without notice. My dad came back; proposed my mum, face sum minor defiance in the 1st place (but they manage to get thru with it) & they get married. 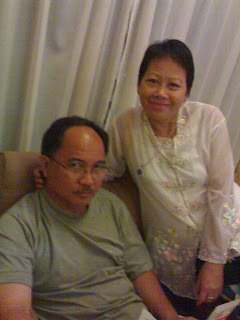 Both my mum & my dad has gone thorough a lots of ups and downs in their journey together as husband and wife. My mum always told to me to find someone who loves me as much as my father loves her. Because it is the love that keeps them together and be their strength through thick & thin (macam soap opera la pulak! :p). And I (we-my sisters) am (are) indeed witnesses to their love towards one another, as well as towards us, their children. I love them so much, and so does my 3 little sisters.